One of the simpler foods that I really enjoy is a good ramen noodle shop (indeed, I’ve reviewed rather a lot of them). It’s been one of the upcoming trendy foods, with ramen shops opening up all over the place, some more Japanese-inspired, some more Korean-inspired. And in any case, they are almost always tasty. But it’s also one of those trends that hasn’t really made inroads into New Hampshire yet. However, a recent recent trip to Portsmouth had us crossing over to Kittery in search of dinner, and we ended up finding that you really don’t need to go that far. Just over the river from Portsmouth, in scenic downtown Kittery (right across from one of the entrances to the shipyard), is Anju Noodle Bar. Anju is one of the Korean-inspired ramen joints. And while I’ve got a fondness for some of the classic Japanese styles of the dish, I’m often excited when I discover a ramen place is Korean-owned for one simple reason: I like a good kimchi. And Anju actually got their start when the owners started off making and selling their own kimchi, and you can still see the fruits of that on their menu; while the menu changes regularly, there’s almost also not just one, or two, but three different kinds of kimchi on the menu. 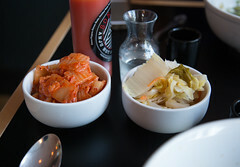 We opted for the classic spicy kimchi, and some white kimchi, both of which were particularly delicious, practically fizzing in their fermentation, and quite delicious. Next up, some onigiri. I never truly know what to expect when getting onigiri: sometimes it’s a simple rice ball with some sesame and nori (don’t get me wrong, done well, that combination is surprisingly often). And sometimes it’s quite elaborate, like Anju’s version: five smaller onigiri, topped with a rich and flavorful duck confit, and covered in a delicious and fiery “Dragon sauce”, this was also another great appetizer to start out the meal. And then, we came to the ramen. 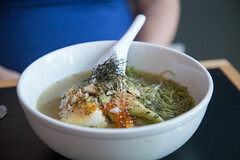 While it’s ostensibly a noodle dish, to me, what really creates a great ramen is a good broth, and I’m particularly into a nicely done bone broth. 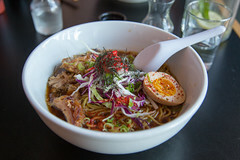 And that’s where Anju shines: starting with bones sourced from Maine Meat (aka “MEat”), they’ve got the basic ramen broth down pat with a wonderfully rich and flavorful broth that’s just teaming with a nice protein flavor and some mild spicing. Add in some really great noodles still slightly firm, some very tender roasted pork sholder, and a good soy egg with a slightly runny yolk, and this was one of the better ramens I had in 2015. Carol, meanwhile, did the seafood ramen, and was similarly rewarded: a rich seafood broth, the same excellent noodles, a bit of roe, and a few nicely poached slabs of fish, and this was also a great dish. Overall, I was quite pleased with Anju, enough that I’m really looking for an excuse to head down that way to go back. Especially since we committed a tactical error: after having seen the cold noodle salad and pork buns delivered to other tables, I simply must head back at some point.